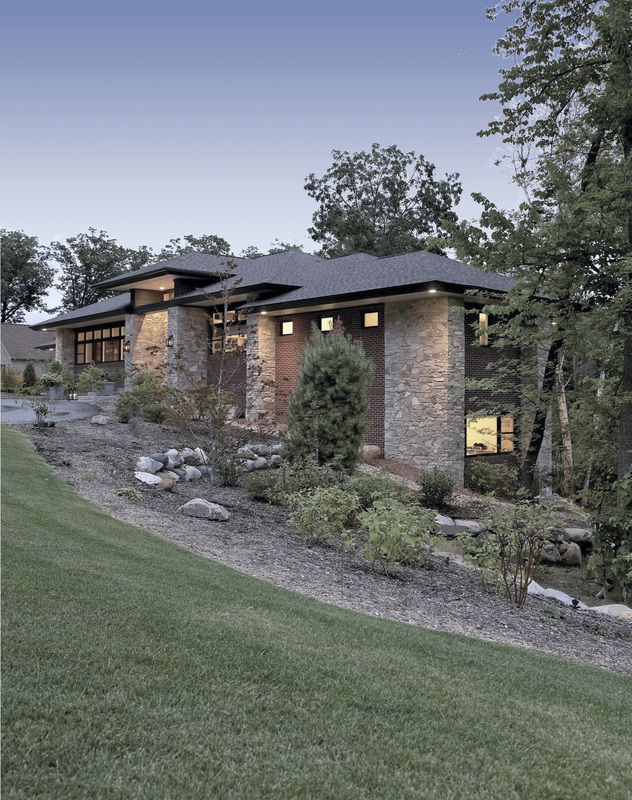 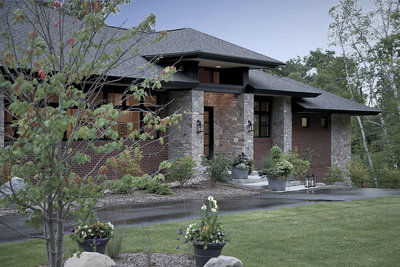 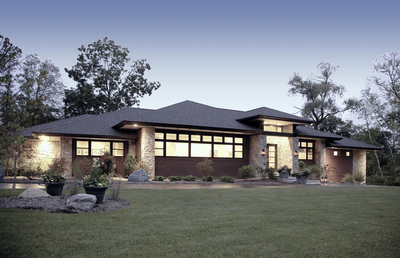 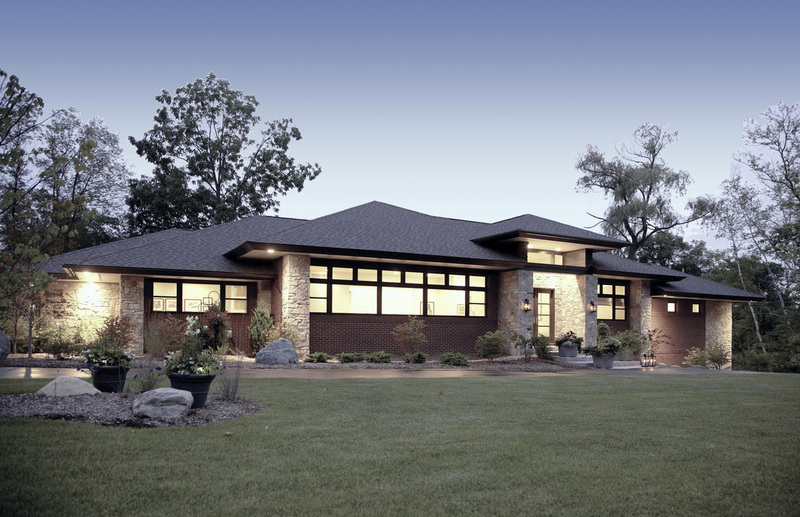 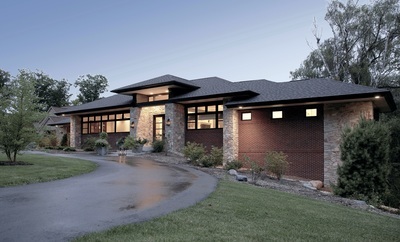 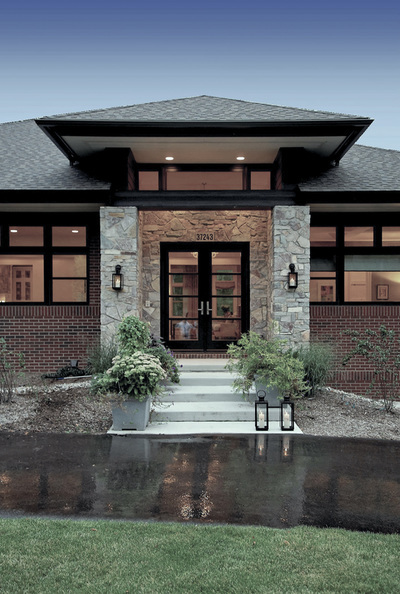 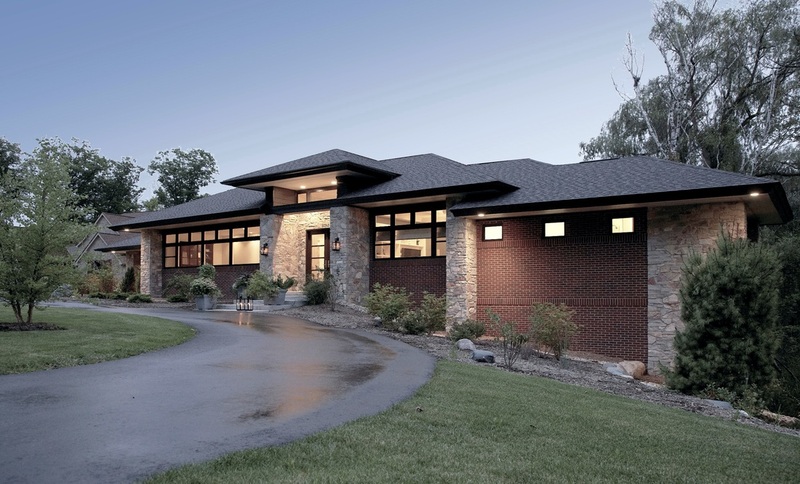 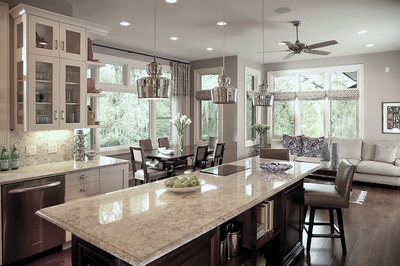 This contemporary Prairie-style home, beautifully designed and sited to relate to its environment, embraces the tenets of Prairie style, while being firmly rooted in this century. 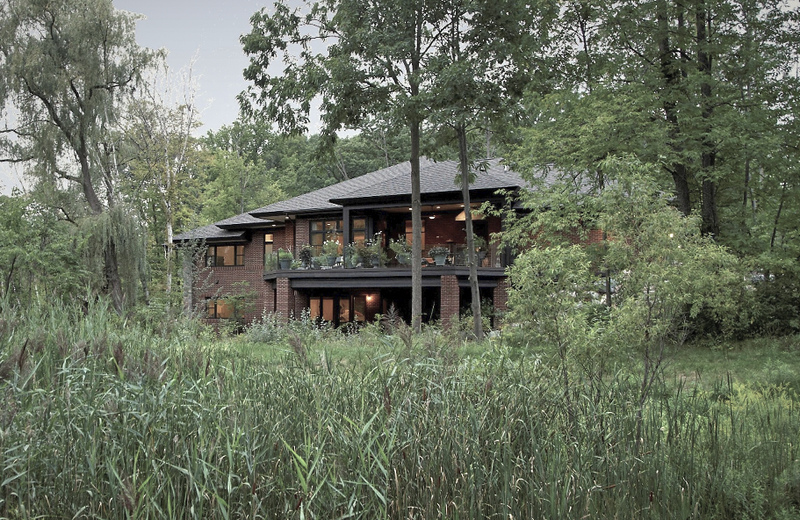 The lot was challenging, sloping to the right and falling off at the rear into a marshy, protected wetland area. Strong vertical lines of natural, rough-cut stone anchor the home to the earth and intersect the strong horizontal lines articulated by the low-pitched hipped roof, wide overhanging eaves, and the banding of windows. 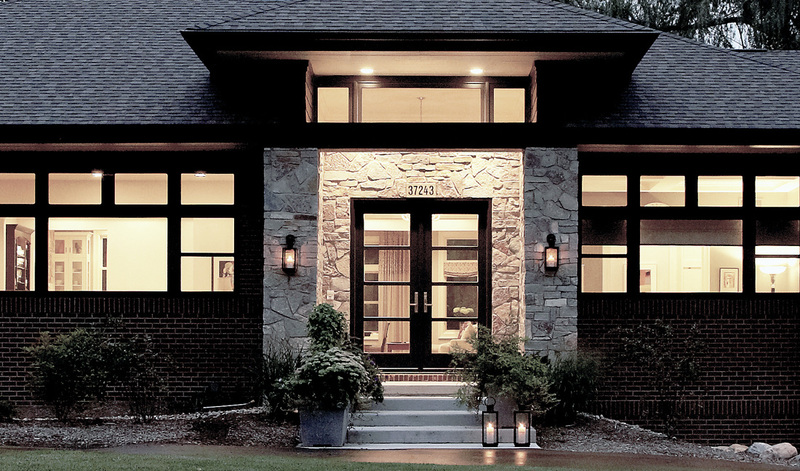 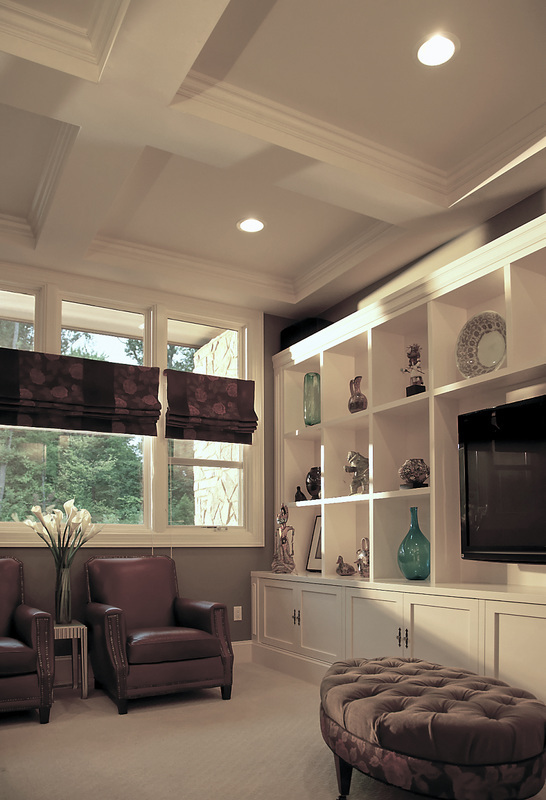 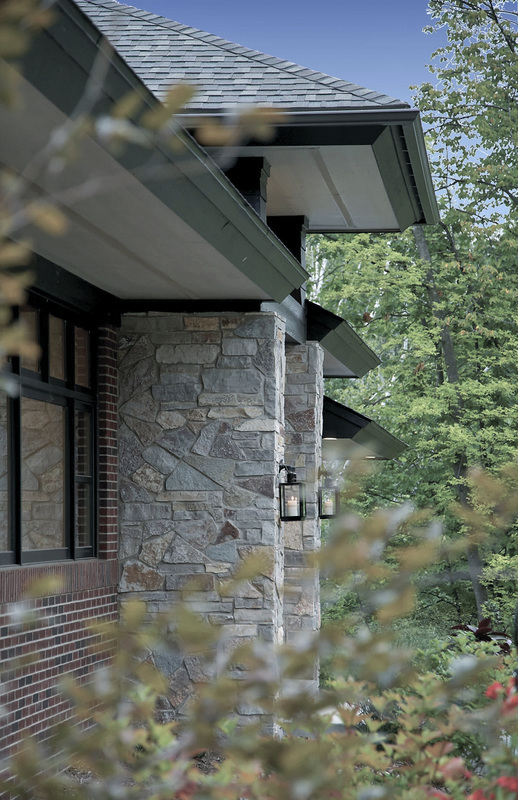 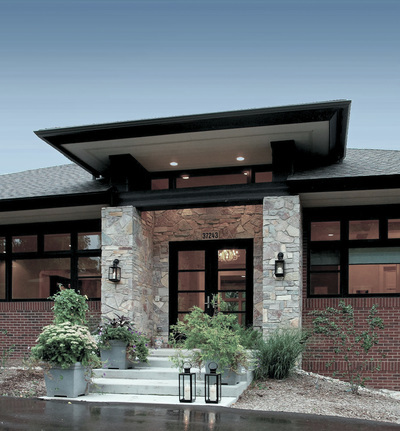 Soffit lighting in the eaves highlights the organic texture of the stone when lit at night. 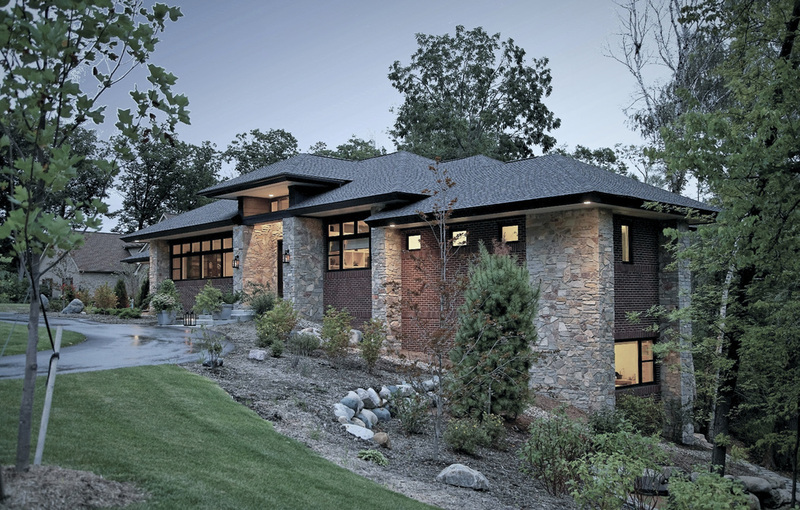 While the exterior building materials were chosen to reflect an authentic Prairie style, the interior is light, bright, and contemporary. ​​Daylight streams through the large windows, furnishings and materials are modern, and the color palette is light and neutral. 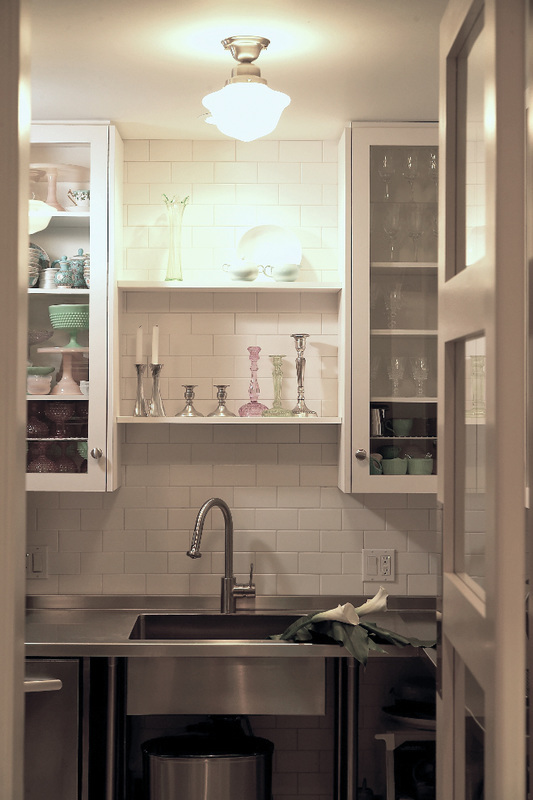 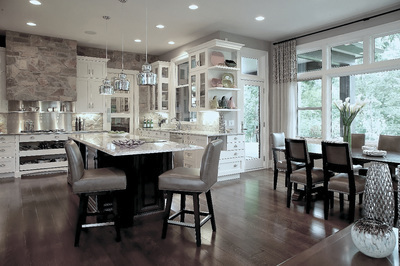 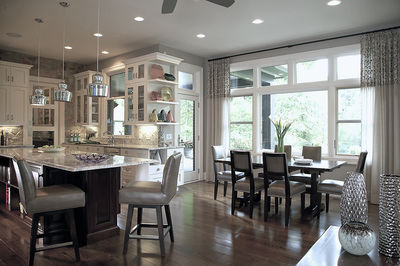 The kitchen of this home is the modern interpretation of the “hearth”, where the family gathers. Designed as one large space, a comfortable sitting/ living area and the casual dining alcove integrate with the spacious, modern kitchen. 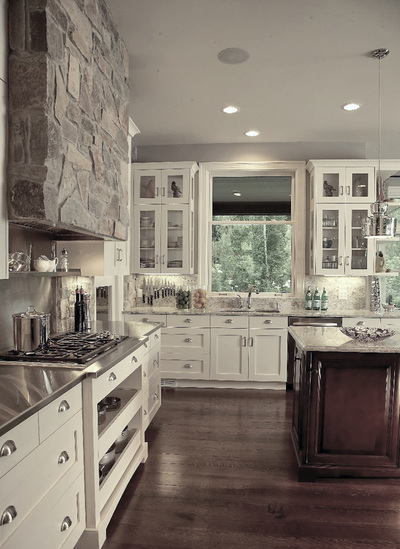 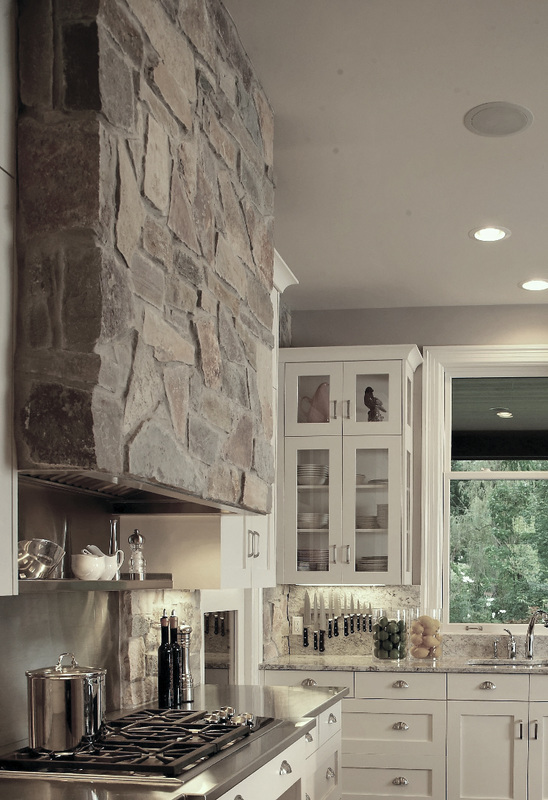 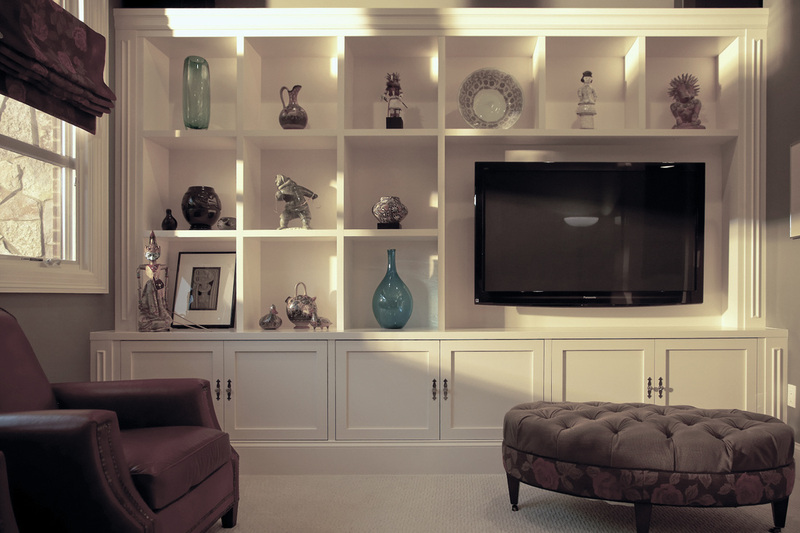 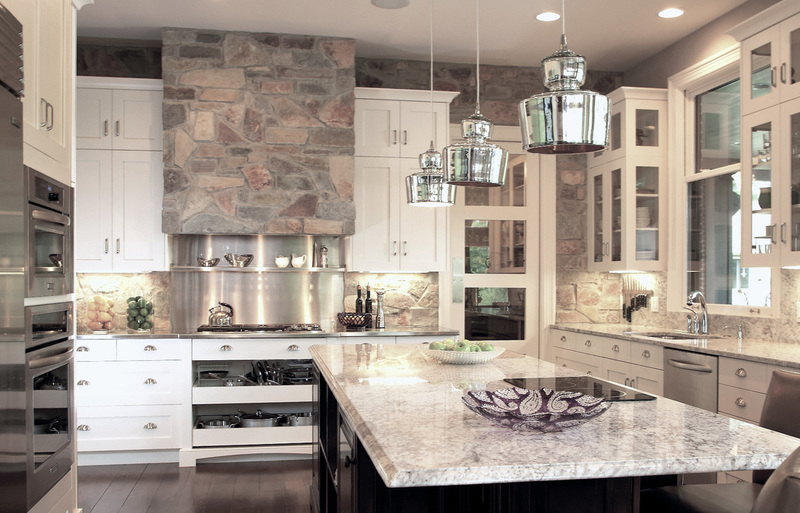 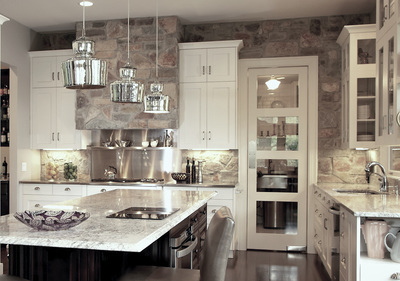 Stone from the exterior was brought into this space and installed on the custom range hood, and the entire east wall, to integrate the interior and exterior spaces. 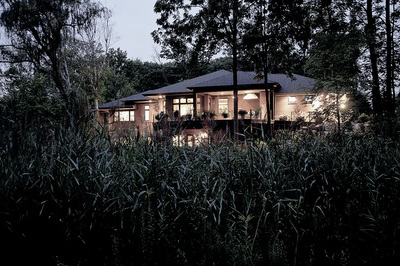 A large living porch, at the rear of the house, with retractable-screens to protect from insects, extends the indoor living space and allows expansive views of the beautiful, marshy wetlands and wildlife.